THE recent war crimes charges filed in Germany against former U.S. Defense Secretary Donald Rumsfeld and his cronies are long overdue. Rumsfeld, the public face of the Iraq war, is also largely responsible for the war’s less publicized side: human rights violations and torture. The suit alleges Rumsfeld’s responsibility for “several dozen individual cases of prisoner maltreatment” and nearly 100 detainee deaths. It is being brought by U.S. and international human rights organizations—among them the Center for Constitutional Rights, the National Lawyers Guild, the International Federation for Human Rights, and the German Republican Attorneys’ Association. The suit invokes Germany’s universal jurisdiction law, which allows the prosecution of war crimes no matter where they were committed. Under the War Crimes Act of 1996 and the Anti-Torture Act of 1996, a “war crime” is any “grave breach” of common Article 3 of the Geneva Conventions, which prohibits “outrages upon personal dignity, in particular, humiliating and degrading treatment,” as well as torture and murder. One of the suit’s many allegations is that Rumsfeld personally ordered harsher torture methods against Mohamed al-Qahtani, the alleged “20th hijacker” of September 11, when al-Qahtani didn’t confess to terrorist activities during initial interrogations. According to the 2005 congressional hearings on the case, Al-Qahtani was stripped, made to wear women’s underwear on his head, denied access to the bathroom, threatened with dogs, and deprived of sleep over a six-week period. The records also say he was kept in solitary confinement for 160 days and questioned for 18 to 20 hours per day. In a December 2002 directive, Rumsfeld also authorized a list of torture techniques for use against terror suspects. This list included hooding, stripping, isolation, seizure of all religious items, deprivation of light and auditory stimuli, and the use of phobias to induce stress. 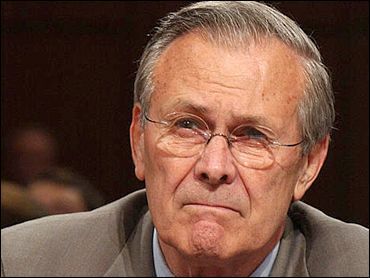 Rumsfeld also authorized the use of waterboarding, a form of torture in which the prisoner is strapped to an inclined board while interrogators run water over his mouth and nostrils to induce the sensation of imminent death by drowning. Furthermore, the former Defense Secretary has admitted to ordering a prisoner’s presence to be kept from prison rolls and hidden from the Red Cross for at least seven months—a violation of the Geneva Convention, which requires that all countries grant Red Cross access to detainees regardless of where they are being held. The suit also cites orders to commit torture, or failures to prevent it, by U.S. Attorney General Alberto Gonzales, former CIA director George Tenet, and recently retired U.S. Army Lieutenant General Ricardo Sanchez, the former commander of U.S. forces in Iraq. The case against Rumsfeld and his cronies is clear and compelling. German prosecutors declined to prosecute a similar, though more limited, suit in 2004. Then, Rumsfeld was protected by general diplomatic immunity. Today, stripped of his title, his flank is exposed. The German courts must uphold the rule of law and rule that Rumsfeld and company have committed war crimes, showing the world that the Bush administration cannot callously discard the human rights it claims to uphold. This editorial was printed in the fourth edition(PDF) of the student newspaper of the School of International and Public Affairs, Communiqué, where I was editor-in-chief, in the spring of 2006.